Update (10/13/16):DOJ just released a plan to gather nationwide data on non-lethal police use of force. But it is up to police departments to volunteer this data. With just a few months left for the Obama administration, the DOJ must raise the stakes and require police collect data on police-community interactions. How many police shootings happen around the country every year? We still don’t know. 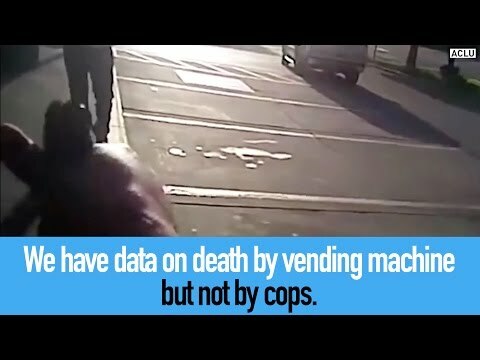 The Federal Government keeps tons of data and statistics on all kinds of topics – from how many people were victims of shark attacks to the number of hogs and pigs living on farms in the U.S. – but we still have no reliable data on how many people are shot by police officers each year. We also don’t have comprehensive data on other police activity like stops, frisks, low level arrests, and uses of force– and the related basic demographic information like race, gender, age, etc. For too long we have been relying on voluntary, self-reporting by police departments. And police departments don’t often volunteer any of this data, even if they’re collecting it, because they’re concerned with their image and liability. It’s time to make this information public – we have the right to know. Police targeting of Black and brown people is a national crisis. The deaths of Michael Brown, Eric Garner, Walter Scott, and so many others have put law enforcement under scrutiny to identify and rectify patterns of misconduct and racial profiling. The first step towards accountability is transparency – tell the DOJ to mandate police departments around the country to collect and share this data. The first step towards accountability is transparency. Mandate that all police departments collect and report data on a quarterly basis on police shootings, and other deaths in custody, as well as stops, frisks, searches, citations, arrests, and uses of force. Create a national public database of this data, including a breakdown by race, gender, age, outcome, and the officer’s basis for the encounter and action.